NASA image created by Jesse Allen, using Landsat data provided by the United States Geological Survey. Caption by Michon Scott. In 1968, after state parks had already been established in northern California, the U.S. Congress established Redwood National Park. This new park supplemented protected lands in the region, and in 1994, state and federal authorities agreed to jointly manage the area’s public lands. 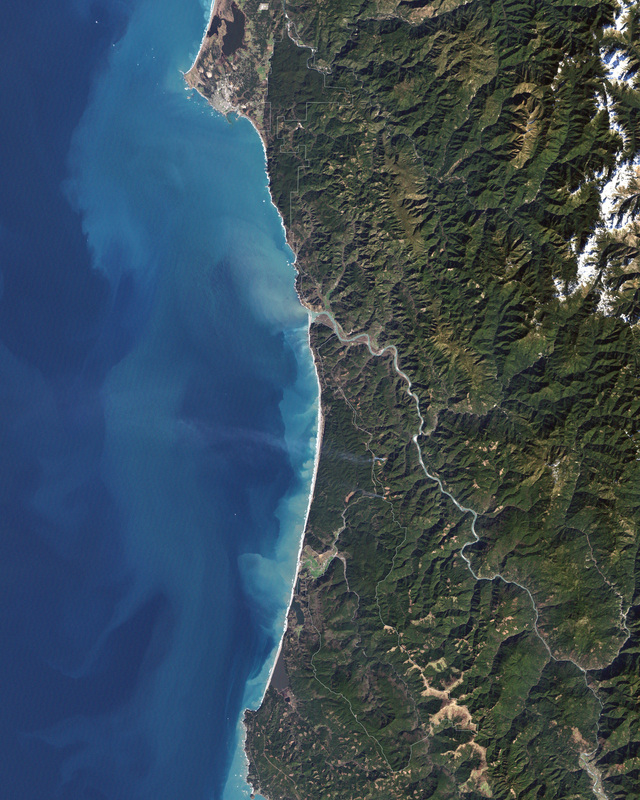 On February 6, 2003, the Enhanced Thamatic Mapper Plus on NASA’s Landsat 7 satellite captured this true-color image of the southern end of Redwood National Park. (A thin coastal corridor connects the northern and southern ends of the park system.) A white border delineates the park boundaries, working around a river near the Orick Horse Trail, close to the coast. Along the coast, sandy beaches appear off-white, and sediments form swirls of pale blue in the darker blue sea. Inland, the park is dominated by green vegetation, with isolated patches of gray-beige rock. This image of the Redwood National Park includes two stands of trees: Lady Bird Johnson Grove and Tall Trees Grove. The first grove was dedicated to the former first lady by President Richard Nixon in August 1969. The second grove became the focus of efforts to protect the surrounding area from logging. 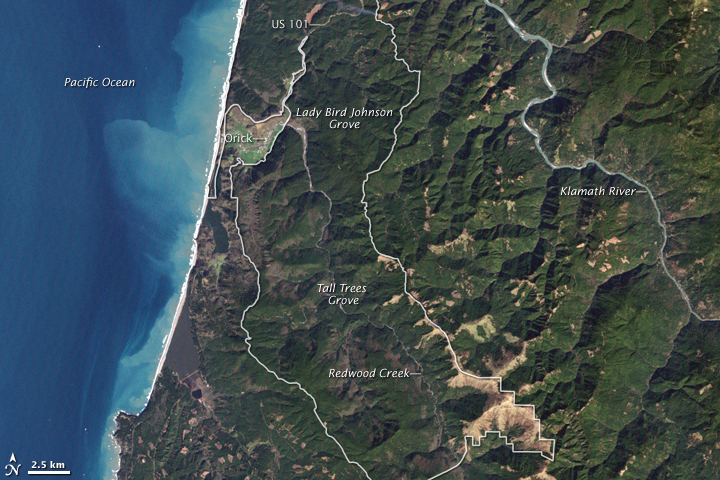 Two waterways appear in this image: Redwood Creek and Klamath River. The more conspicuous Klamath River flows through the park system’s midsection (north of the area pictured here). Redwood Creek flows through the southern portion of the park system. Both waterways have carved gorges through the mountainous landscape. Redwood National and State Parks occupy an area considered to be the most seismically active in the United States. The frequent seismic activity has led to shifting waterways, landslides, and rapid erosion along the coastline. National Park Service. Redwood National and State Parks, California. Accessed February 19, 2009. Uhler, J.W. Redwood National Park Map Page. Accessed February 19, 2009.